I'm pleased to announce Megan of City Stitches is releasing her first pattern!!! As a young quilter, it's nice to see a fellow young quilter taking the dive. Megan has hosted quilt alongs before but this one is especially exciting as it is her own pattern! The pattern is available for purchase as a PDF on Aria Lane, and in order to participate, you will need to buy a copy since we will not be providing templates or specific details of the pattern in the Quilt Along posts. Tammy of Marmalade Fabrics is our wonderful Quilt Along Sponsor and will be providing the Grand Prize, as well as two other prizes for me to give away on a whim during the course of the Quilt Along. The grand prize will be a rainbow stack of 40 Robert Kaufman Kona Solids. The prizes to give away during the Quilt Along, well, you'll have to stay tuned for those! Check the schedule below to see where you need to go each day to win a pattern! 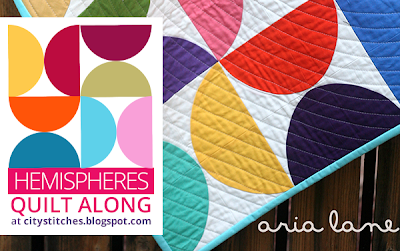 Be sure to show us your progress in the Hemispheres Quilt Along Flickr Group! Feel free to grab it and share it on your blog! On December 9th there will be a linky party set up right here on Megan's blog. Upload your finished quilt to be in the running for the Grand Prize. They will pick finalists from the pool of linky party submissions, and those finalists will be posted here on December 10th. Then it is up to all of you! Come back and vote for your favorite quilt and help pick the winner of the Hemispheres Quilt Along!! For your chance to win a pattern, leave a comment on this post! Winner is #18 - Wendy!! OMG I have never tryed to make anything with curves but I'm so in love with this quilt that with a little help I I hope I will be able to make this quilt and if I'm able to make it I'm gonna keep it all for myself.....lol! Thanks for the chance to win this pattern!! I'd love to win and join my first Quilt-A-Long! would love to win this pattern. Having only ever tried curves once (and it was a total disaster!) I would love to give it another go! I would love to make this quilt! Love it! Thanks for the giveaway! I love this pattern and have been obsessing about it. I'd love a chance to win the pattern! I'd love to try this pattern! It's so different from anything else I've ever made! thanks for the opportunity...I'd love to win this pattern! This looks such a great pattern - I'd like to make a rainbow version! Love the fun solid colors! Have not sewn curves but there is always a first time right? Thanks for the chance to win. wow I love this quilt. I have never done curves yet (still a newbie) but it is on my list to do. Would love to win this so I can try. Thanks for a chance. I love this quilt pattern and want to make one for my daughter. She'll love it! I'm in love with this pattern and the fun solids! Fingers crossed, hehe. Thank you and Megan for a super giveaway and the chance to win. I'm so in love with this pattern! I'd buy it in a heartbeat if I could afford it. Love to sew curves! I would love to win the pattern and participate in the quilt along. Thanks! What a delightful quilt with great possibilities. Thanks for the opportunity to win a copy of the pattern. Gorgeous quilt to showcase the beautiful kona fabrics!! This quilt looks like so much fun to make. Great with solids. I have been looking for the perfect quilt with curves, and this is it! I would love to learn more about curves. I have a pile of Kona solids just waiting for something like this! Thanks for the chance to win the pattern!